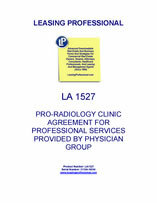 This professional service agreement documents the contractual relationship between a radiology oncology clinic and a physician group that practices radiology oncology medicine. The agreement favors the owners of the clinic, and outlines a month to month arrangement that continues until terminated by one of the parties as provided in the agreement. The agreement contains, among others, several representations and warranties by the doctor group concerning medical licensing, Board Certifications of members of the physician group, and the status of admitting and hospital staff privileges. The agreement also contains restrictions upon the doctor group with regard to post termination competition and solicitation of or hiring of employees and consultants of the clinic owners. THIS PROFESSIONAL SERVICES AGREEMENT (the “Agreement”) is made this __ day of ________, 20__ between Modern Radiation Clinic LLC, a _______ limited liability company (the “Clinic”) and Specialty Physician Group PA, a _______ professional association (the “Group”). 1. Clinic operates a radiation oncology office at _________________, _______ (the “Practice”) and renders medical treatment to such members of the general public as the Clinic from time to time accepts as patients (the “Patients”). 2. Group provides professional radiation oncology services through its owners and affiliated physicians who are authorized and licensed to engage in the practice of medicine in the State of _______. 3. Clinic and the Group have agreed that the Clinic would employ the Group to provide professional medical services to its Patients, upon the terms and conditions more particularly set forth in this Agreement. 1. Employment. Subject to the terms and conditions of this Agreement, Group shall be contracted by the Clinic to render professional medical services to the Clinic’s Patients. 2. Term. The Group’s engagement hereunder shall commence on the date hereof and shall continue on a month-to-month basis, unless terminated earlier as provided herein (the “Term”). 3.1 Group shall receive a quarterly amount equal to one hundred percent (100%) of the quarterly Professional Collections received by Clinic from services rendered by or under the supervision of Group’s owner and physicians at the Practice. For these purposes Practice Professional Collections shall mean _____ percent (___%) of the net fees billed and collected by Clinic for services provided to patients at Clinic’s Practice. Net fees shall be calculated as global fees billed and collected by Clinic for services provided to patients at Clinic’s Practice for each three months of this Agreement less refunds and overpayments for the Practice in the same three-month period. 3.2 Compensation shall be payable quarterly and the amount due to Group shall be settled within 30 days of the end of each quarterly period. 4.8 Group’s owners and physicians have never been denied medical malpractice insurance coverage with respect to any application therefor or under any policy thereof for any reason, and Group knows of no fact, condition, circumstance, or event that has caused or would cause Group to be denied or uninsurable for medical malpractice insurance coverage. 5.1 Area of Responsibility. The principal areas of responsibility of Group's owners and physicians shall be predominantly within the specialty of radiation oncology. The Clinic agrees that the Group’s owners and physicians shall have such authority as may be reasonably required by Group in order to discharge such responsibilities in an efficient and proper manner. 6. Clinic’s Patients. Clinic shall determine who shall be accepted as its Patients, and Group recognizes that such Patients accepted are Patients of Clinic and not the Group. Clinic shall designate, or establish a procedure for designating, which of its engaged professional Groups shall treat each such Patient. Group shall be free to exercise Group’s professional judgment in connection with the diagnosis and treatment of Patients and in fulfilling Group’s responsibilities for Clinic; however, Group agrees to observe and comply with the policies, standards, and procedures of Clinic as the same shall exist and be modified from time to time by Clinic, provided they are reasonable and do not violate any applicable statute, law, rule, or regulation, of any governmental body. Upon the request of the Clinic in connection with a claim, action, or specific Patient question, whether made during the term of this Agreement or following its expiration or other termination, Group shall provide in writing a true and complete account of all procedures relating to the rendering of professional services by Group in connection with such claim, action, or Patient question.